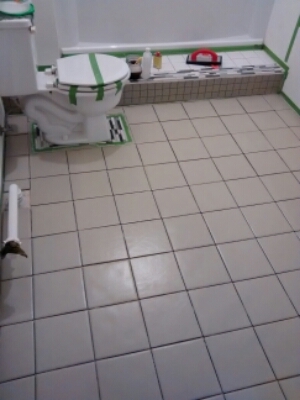 This basement bathroom needed a floor covering, other than plain painted concrete. 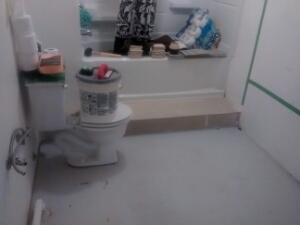 The Habitat For Humanity building supply store supplied odd and end ceramic tiles for this project, with a cost of $40 for the small 7′ x 8′ basement bathroom. Three different size and shape tiles were used to mimic the design of rectangles and squares within the shower unit. Glass tiling was purchased specifically to accent areas of the floor design. Accent tiles, grout and wet saw cost $100 at Home Depot . Painting ceramic tile requires wet sanding with 240 grit paper. The surface must bond with the paint to bond on the tiles surface. Painting a floor requires paint which could withstand not only foot traffic but also water. A quart of Sherwin William’s gray enamel floor paint and a gallon of wet look finish for concrete sealer cost $30. The color choice of gray, dark blue and black are mixed with glaze medium. The blue and black were purchased as paint samples from Home Depot for $21. When mixed with glaze medium it gave just the right amount for this small project floor design. Wet sanding between base coat and sponging color layers is necessary for bonding purposes. Extended dry times are needed for curing the paint surface from chipping. The gray base coat was cured and sanded. Wash floor before adding faux sponge technique and allow ample dry time of floor surface. Two applications of sponging are applied to work out design patterning on the floor. Once finished to desired look, an extended daytime was applied to cure a hard paint surface. The final color mix and wet look sealant was then applied with three coats. Allowing the floor’s painted surface to cure for seven days before grouting bathroom floor will prevent chipping of any paint on the tile. The pewter colored grout was chosen to pull the design together as a whole. Once the walls are painted blue and white painted baseboard applied, the floor was chalked with a gray ceramic tile chalk to waterproof the floor and wood surfaces along the edge of walls. When everything is finished, this project pushed my skill level with the trim work that was used around the shower. 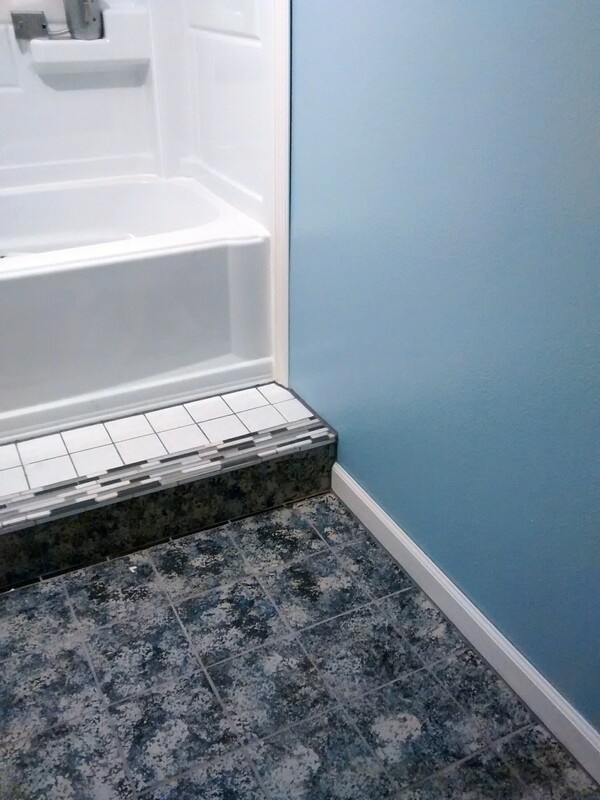 After purchasing the trim for shower and baseboards, our over all cost was less than $200 for the entire project. For the floor, we are very satisfied in the outcome of the overall project. The project took longer than we expected, but it was worth the wait for our new beautiful bathroom. 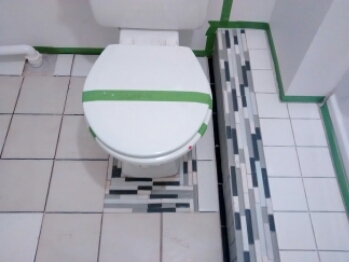 Wow that finished tile looks amazing! I love the dark colors mixed with the light. Thanks for sharing!